Delandapalooza Music and Arts Festival come one, come all! 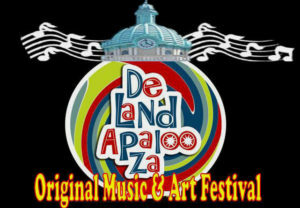 Delandapalooza is a monumental festival for the creativity of music and art. There are over 150 musical acts performing on 28 different stages over a period of 12 hours. We have many musical categories including but not limited to; Rock, Folk, Blues, Americana, Jazz, Country, Metal, and much more! On top of all this, there will also be 40 different art displays featuring multiple vendors.